An easy makeover anyone can do. 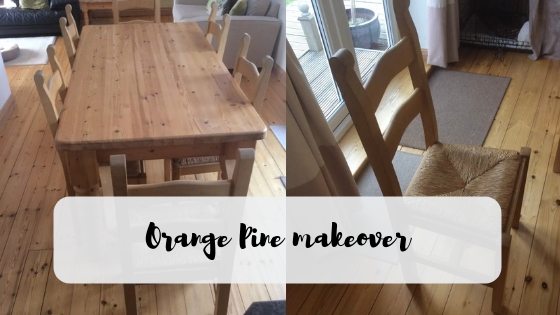 Orange pine is probably the most common type of furniture that is first on the chopping block for a makeover. Its sturdy and usually well made but the colour pine goes over the years is just unattractive. I had this chunky pine dining set in my stash ready for a makeover and thought I’d try something a little different. I usually work with large extendable French oak dining tables and I almost always strip the tops and paint the chairs and bases. I wanted to do the same with this set but when it was stripped the top was so orange I knew I had to think of something else. 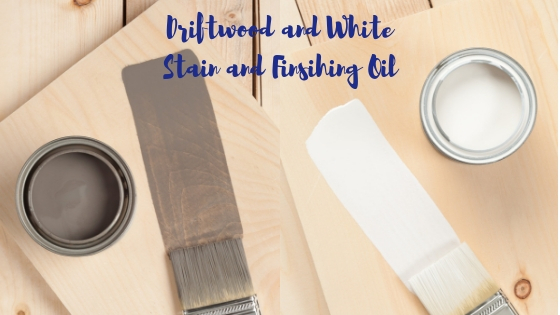 Stain and Finishing Oil to the rescue. The whole set was stripped and I used mineral spirits to remove the wax that was on top. The base luckily didn’t have any wax on so it was a clean with Fusions TSP and a light sand all over with a 240 grit Sandi Hand ( you gotta check these out! Prep made easy! ) Once that was done it was clear the top was going to need painting or some finish on it as it was just ugly orange. 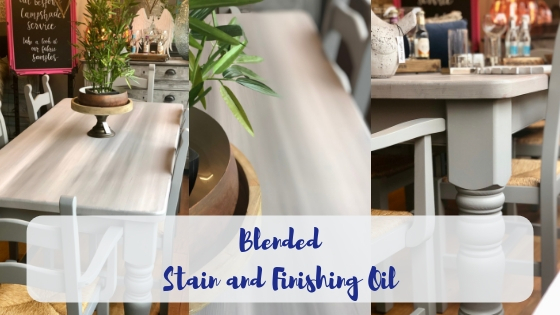 Stain and Finishing Oil all in one actually does exactly what it says on the tin…. imagine that! So on prepared wood it will stain it and top coat it all in one application. Unfortunately it’s not available in the U.K. but I acquired some when I was in Canada for the Fusion Merchant Retreat and decided to put it to good use. I wanted to cover the orange top so I knew I needed to either use a darker colour like Cappuccino, black or a different sort of finish was needed. Now I had seen Loree ( HomeStead House Paint Co ) do a blend effect with a couple of the SFO so thought that might be a good place to start. I choose Driftwood and White because I was going to use Little Lamb for the base and chairs and thought it would match good. 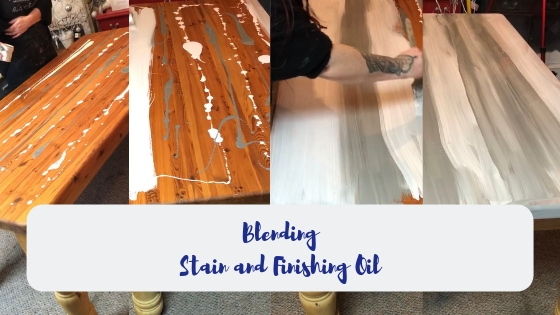 Blending the Stain and Finishing Oil. I started by pouring on the 2 colours and I used more than required as I wanted a solid colour not a stain, this should be used as a wipe off application so I knew I would have a long drying and cure time by leaving a lot of the product on the surface. I just blended the 2 colours by dragging my brush up and down the length of the table until I was haooy with the way it looked. I had to clean up the edges and there was a lot of waste but I knew it would look fab. The SFO continued to soak into the wood for a while and it looked a bit different everyday until it was dry. It took around a week to be dry enough to put it in the shop and its has over 8 weeks now and it feels hard. 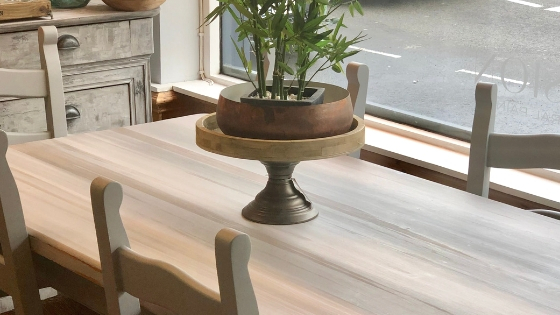 This finish was design for floors so it’s a tough hardwearing finish perfect for dining tables. We even used it in our Christmas window and got a lot of compliments. I’m really pleased with how this turned out. The dry time was worth the wait! Drop me a comment and let me know what you think? Oh my, we seriously need this stain in the U.K. Simply stunning! 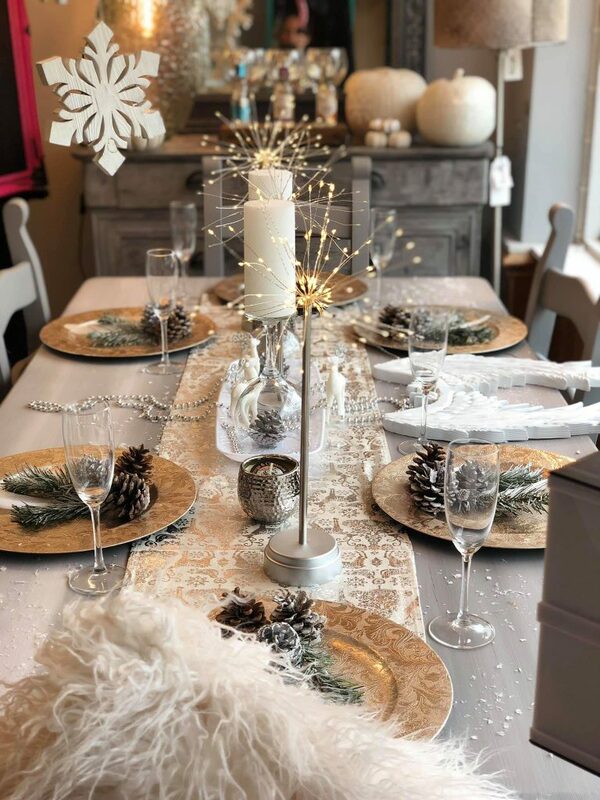 I would love to use this idea on my dining table as it definitely needs a refurb. Do you think we’ll be able to get this product here soon? Sarah, that is awesome!!!!! You are truly amazing!!! Would it be possible to get this effect using mineral paint instead of the stain? If a Base coat in the light colour was applied to lighten the wood could you use this blending technique on top? Yes fir sure I have done just that before, I didn’t lighten the top first I just started with a Little Lamb wash let it dry lightly sanded and added a wash of Raw Silk over top in a stria sorta design. It worked great!! let me know if you do it I’d love to see some pictures.